There’s more to SharePoint than just the technical solutions. There is more than just setting up the servers and the security. There’s more than developing the custom solutions. It’s necessary to educate the project managers, business analysts, instructors, and all of the employees in the organization. Where most SharePoint companies focus on the developer or the IT professional setting up the servers or both, we focus on ensuring the organization has the tools it needs to get value out of the SharePoint platform – to ensure there’s business value derived from the platform. If you like the SharePoint Shepherd’s Guide for End Users, you’ll love this new reference guide. We’ve developed the SharePoint Shepherd’s User Interface (UI) Quick Reference as part of the series of tools we offer to promote user adoption and increased productivity with SharePoint. You can check out a non-printable sample of the card here. The UI Quick Reference cards are printed on heavy coated cardstock to withstand daily use and are intended to be handed out to folks to have at their desk to help them understand how to maneuver in SharePoint. It’s one of those simple things we’ve found valuable in helping people to make better use of SharePoint. With simple, non-technical descriptions for the various navigation controls in SharePoint 2013, as well as definitions of some of the key features and concepts that end users need to know to put them at ease with and encourage their use of SharePoint, the UI Quick Reference card is a tool you’ll want your users to keep on hand. As always, we welcome your feedback about the issues your business and your users are facing with SharePoint. We are continuously looking for opportunities to help improve SharePoint adoption and user productivity. 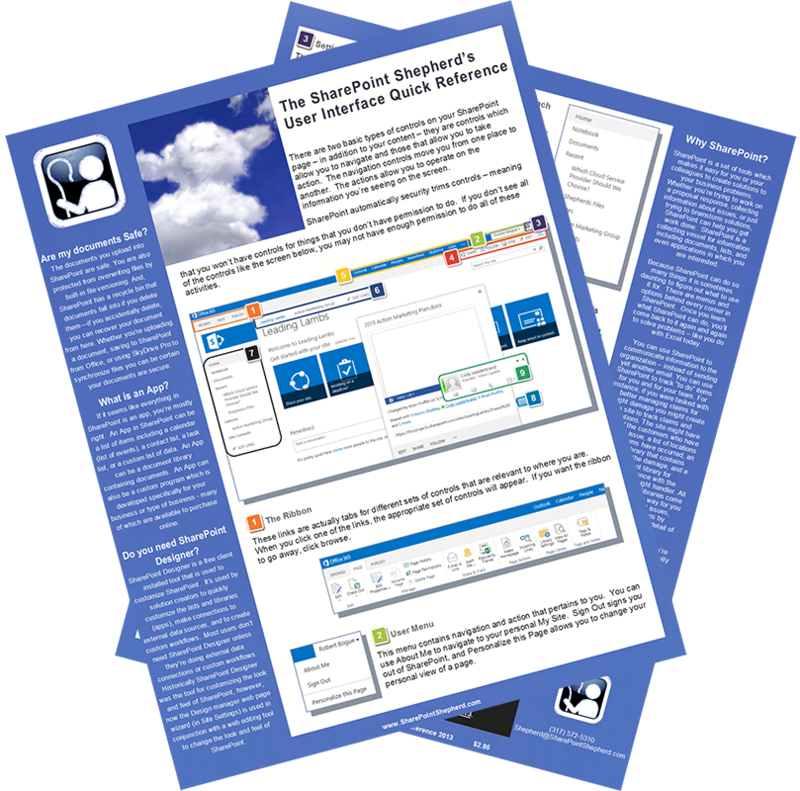 If an upgrade to SharePoint 2013 is in your future, now is the time to consider the SharePoint Shepherd’s Guide for End Users: 2013!